Interesting new spirits are unfortunately not often seen in the Middle East. 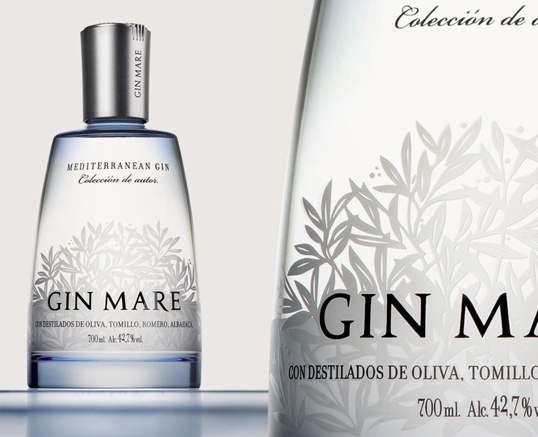 That's why I was pretty excited, when Carlos, the brand ambassador of Gin Mare told me, that his product has landed and was already in use in a couple of bars. He sent me a bottle over [that took quite a while, as the respective supplier wasn't really aware of this new small volume product. But when I had it in my hands, I was quite happy. The bottle is really beautiful. It definitely looks distinctively different than any other gin [or vodka] - modern, but not futuristic - just strikingly beautiful. Mediterranean botanicals - like rosemary, thyme and olives? Interesting. Individual distillation of the specific infused neutral spirit? Controversial - but still intriguing. But how are my impressions? I know - gin is translucent, but the viscosity is appealing- there are directly very thin and fast legs running down the glass wall after swirling - but very slowly, there are after quite some time also very slow drops rinsing down. This has to have something to do with the different distillates. Yes - it is directly distinguishable as gin. But it has an unusual savory note, which is quite appealing. Simultaneous you can also experience citrus notes [deriving from the citrus peels as well as the coriander] and the juniper is also not hiding and adds its piney note. It is in the first moment quite sweet [sweet alcohol] on the tongue, until within a split of the second the botanicals kick in. Then there is a quite unique bitterness, quite some alcoholic burn [in a neutral way], bitter citrus and again savory notes. The bitterness is quite long lasting. But: gin is usually not consumed on its own, but in a drink. A martini cocktail was ok - interesting, but not very appealing to me. I haven't tried a dirty martini [this could be a hit though]. A gin & tonic was much better - while the Gin Mare was adequate and unique, it could not really pass other premium gins. 120 ml tonic water [I prefer Canada dry] or even better 80 ml of tonic water and 40 ml of lemon lime soda. The apple juice highlights the brininess of the gin, and plays a quizzical but pleasant role in the drink. But the apple juice and optional lemon-lime soda also tames down the overall quinine bitterness [which will have the result, that you can drink much more than the usual 3 or 4 gin and tonics]. The bitterness of the gin however counters the additional sweetness of the apple juice [and soda]. But is it worth it to add into the portfolio? I have to be honest - I don't [yet] know. It is definitely different and the bottle looks so pretty, but these are not necessarily proper reasons, why you should list, buy or drink a gin. Usually I am pretty pragmatic, when it comes to new and hyped ingredients: if the product is not striking enough to convince guests on the first sip and/or be asked for, I am usually quite negative. I hate to bloat up the portfolio with meaningless items. Gin Mare is however quite unique. It is not a head turner - but very few gins are [in comparison to other premium gins]; but it is distinctive enough. Coming soon: a proper review form with calculated ratings!